This annual anthology brings together the year's finest mathematics writing from around the world. Featuring promising new voices alongside some of the foremost names in the field, The Best Writing on Mathematics 2013 makes available to a wide audience many articles not easily found anywhere else--and you don't need to be a mathematician to enjoy them. These writings offer surprising insights into the nature, meaning, and practice of mathematics today. They delve into the history, philosophy, teaching, and everyday occurrences of math, and take readers behind the scenes of today's hottest mathematical debates. Here Philip Davis offers a panoramic view of mathematics in contemporary society; Terence Tao discusses aspects of universal mathematical laws in complex systems; Ian Stewart explains how in mathematics everything arises out of nothing; Erin Maloney and Sian Beilock consider the mathematical anxiety experienced by many students and suggest effective remedies; Elie Ayache argues that exchange prices reached in open market transactions transcend the common notion of probability; and much, much more. 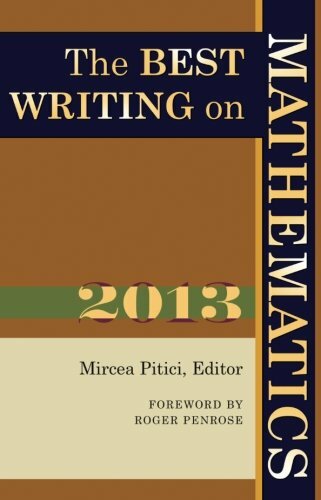 In addition to presenting the year's most memorable writings on mathematics, this must-have anthology includes a foreword by esteemed mathematical physicist Roger Penrose and an introduction by the editor, Mircea Pitici. This book belongs on the shelf of anyone interested in where math has taken us--and where it is headed. About: This annual anthology brings together the year's finest mathematics writing from around the world.